The compact sedan segment has been the most exciting and happening segment in India for some time. With the latest entry – Tata Zest – Hyundai Xcent especially has started to feel the heat. So here is the comparison between these two stalwarts of the Indian automobile industry. 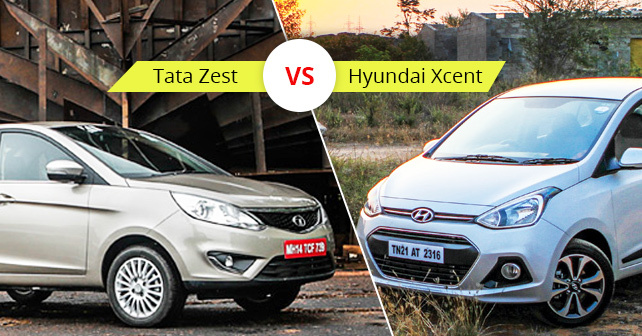 Read on our Tata Zest vs Hyundai Xcent comparison. The second contender here is the Hyundai Xcent which has been fighting with the Tata Zest for the number three spot in the segment, after Maruti Suzuki Dzire and the Honda Amaze, for some time. The two engine options – the 1.2-litre petrol offering 82bhp and the 1.1-litre CRDi mill producing 71bhp – are available with the reliability factor that comes free of cost with Hyundai. The suspension, handling, drive quality are all top notch, and the only thing not-so-impressive is the responsiveness of the steering. The interiors and the features are pretty much in sync with the expectations, but the Honda Amaze wins over this one by a slight, but visible, margin. On the road, the Xcent is extremely refined – and actually doesn’t feel underpowered at all. Sure, the three-cylinder lump is a little rough at idle, but on the move it has decent mid-range and isn’t stressed at all – after all, it produces 180Nm at just 1,750rpm. On the road it simply isolates you from the chaos around you and allows you to focus on all the goodies within the cabin – of which there are many, as is the case with all of Hyundai’s new cars. The trouble on the track, though, is clearly apparent every time you hit 4,000rpm. At this point, the power just falls off a cliff. So it is tough to find a clear cut winner here in our Xcent vs Zest comparison as both these cars offer features truly unique to them. But the car that really inspired us in our Tata Zest vs Xcent comparison was the Zest as it outshone the Xcent at different levels and in various categories.